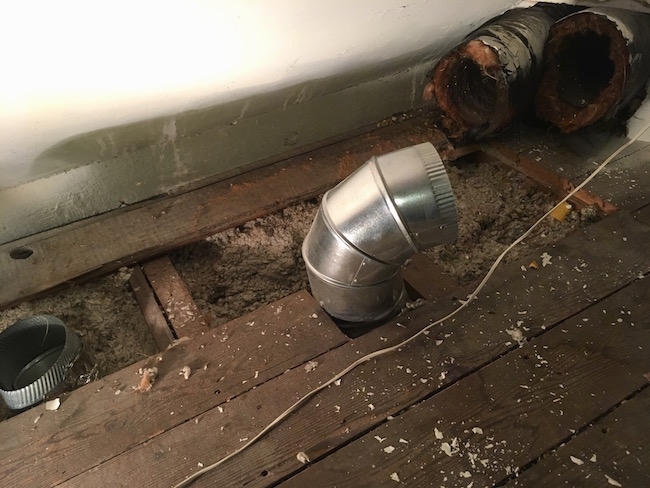 In order to remove the blown in fiberglass from under the floor we needed to remove the third floor HVAC system. 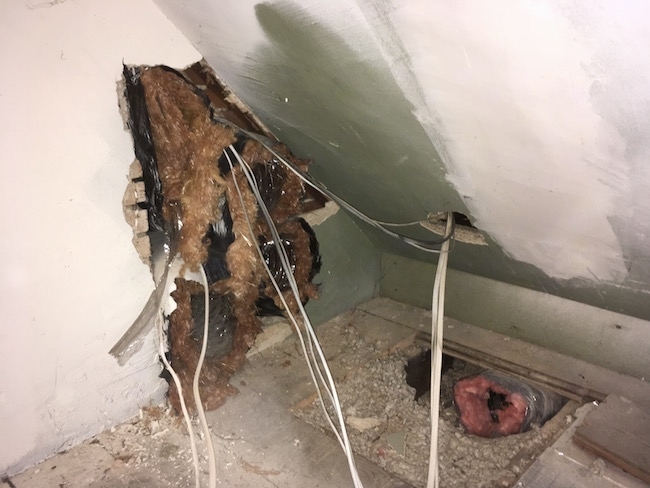 This section seemed to be one of the problem areas that was causing the gray loose fiberglass to fall down to the lower levels of the home as it followed the ductwork and wires. We plan on replacing it with a ductless split system. This is part of the area where the HVAC system was sitting. It still baffles my mind that anyone would think it was a good idea to blow spun glass into a home where humans live. 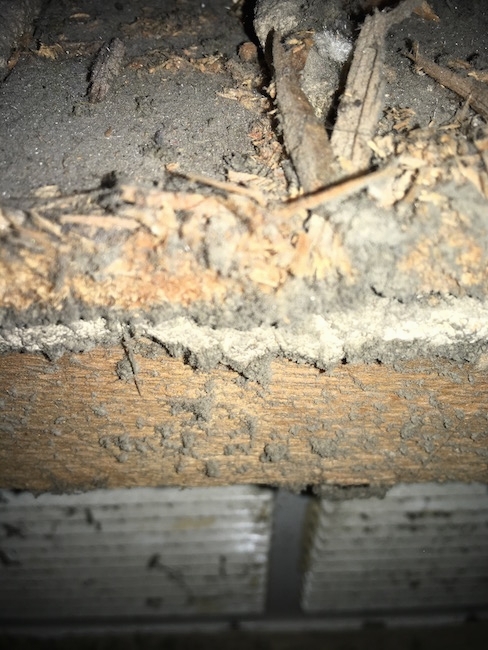 And on top of that, run wires and ducts through it down the walls to the lower levels of the home for an indefinite amount of time, as if materials do not have a shelf life. 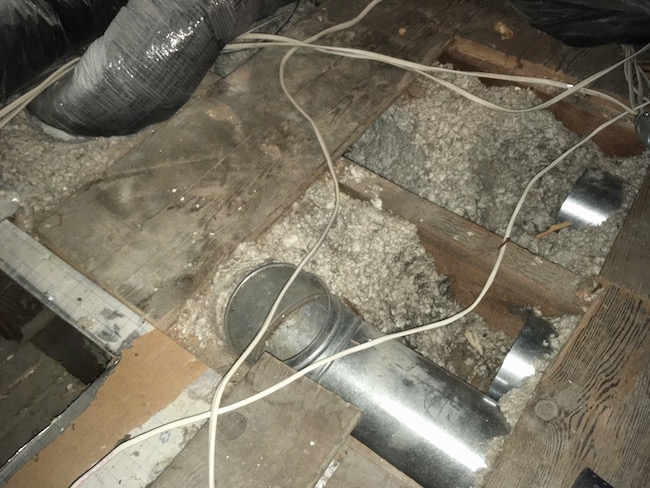 Ducts running through the floor past the blown in insulation. 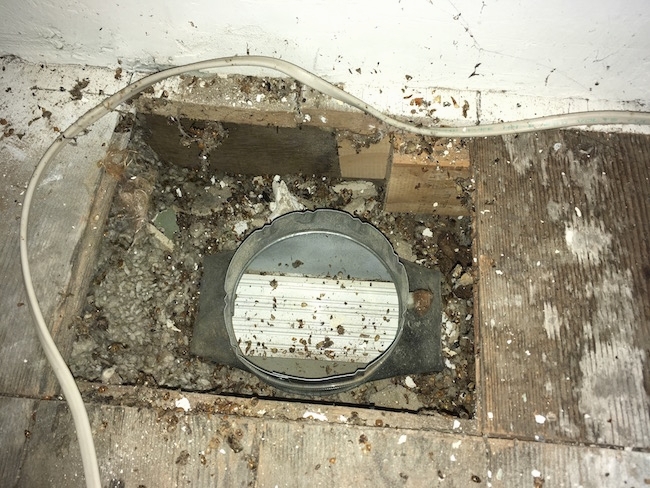 The areas were the duct passes from one floor to the next are not sealed tightly. No one was trying to keep the tiny shards of glass from leaving the attic area. 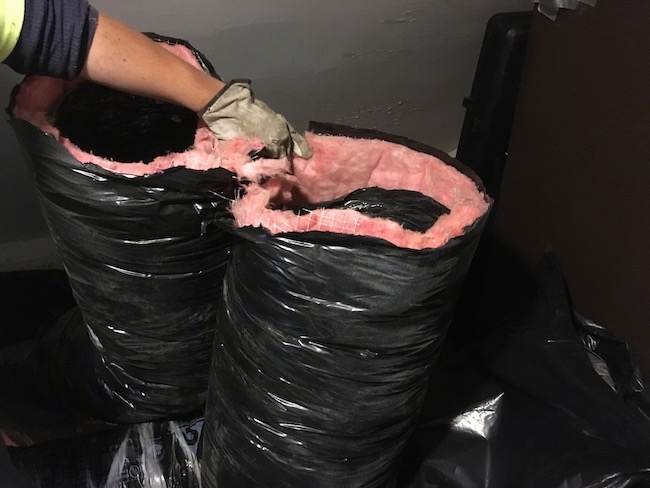 When I would walk into my house with this blown in insulation, it immediately went to my lungs which reacted by tightening, heart racing, eyes burning and I would have to concentrate to keep from tossing my cookies. Others in the house did not feel the immediate effects. Had it not been for me bringing it to everyone's attention we would all still be living among the airborne poison not understanding why we get headaches, nightly leg cramps, upset stomachs, restless leg, reflux and various other symtoms. 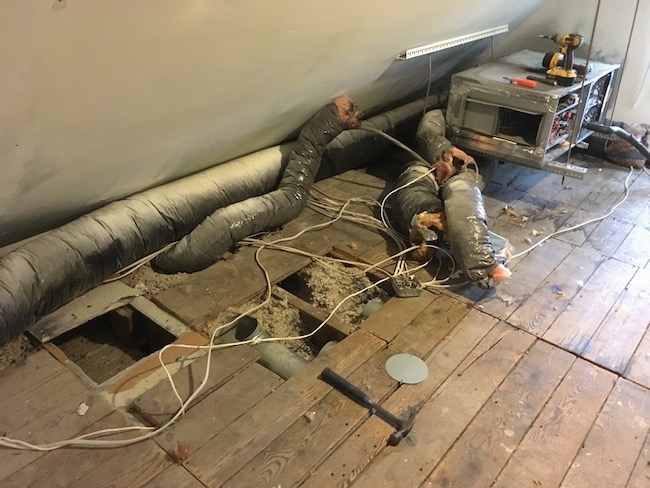 Flex ducts lined with fiberglass being removed from the home. 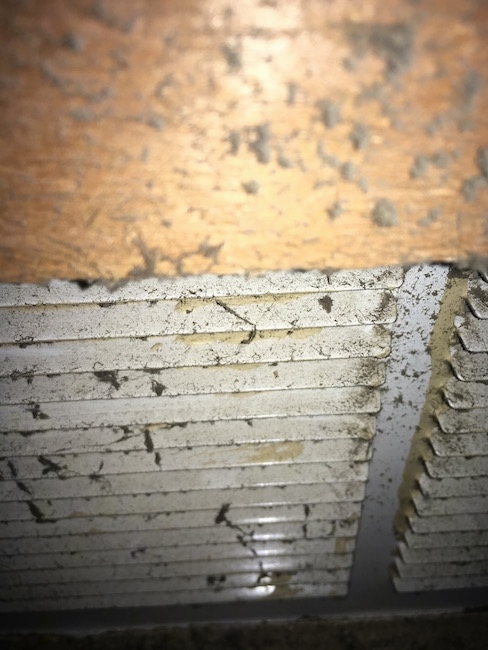 There clearly is not a lot of thought put into keeping indoor air clean. 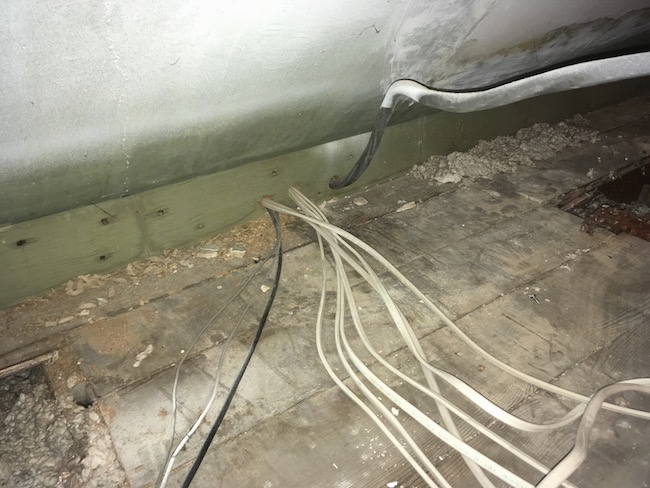 Contractors place air returns close to things like exposed fiberglass and in random places behind walls that can't possibly be pulling in fresh clean air. In our day and age one would think that we humans would put more thought into the air we are breathing inside of our own homes. 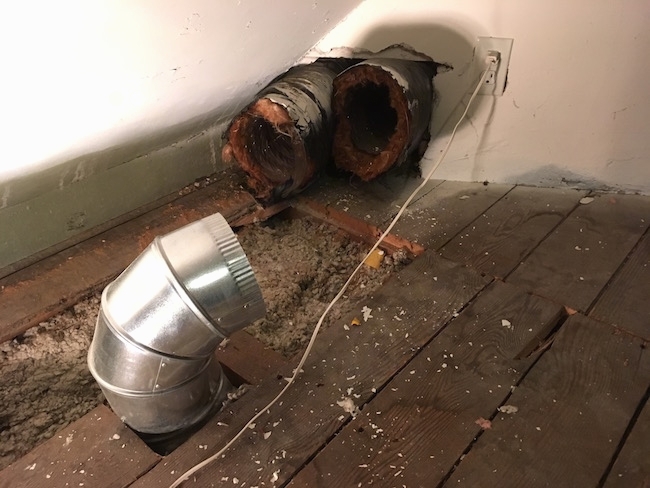 While the house is old, the HVAC system was not. The practice of installing these systems with little to no thought put into the indoor air is still going on today. 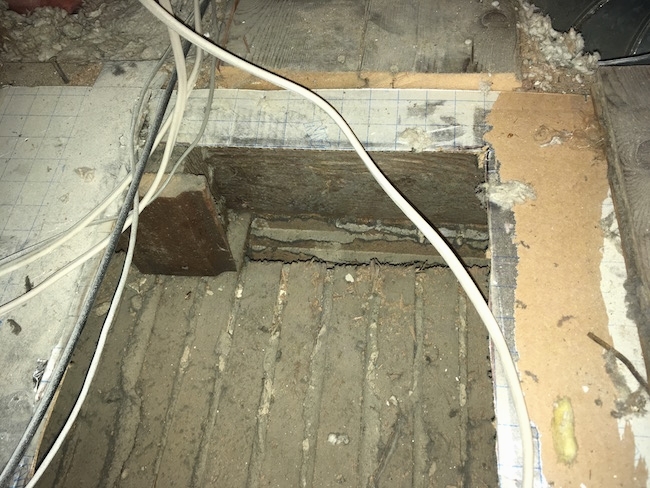 The blown in glass is just pushed aside as they run air ducts that will blow into the rest of the home, not sealing the cracks between the fiberglass and the hole in the floor. A return air vent. What a great place to pull air from to blow into the rest of the home. No worries it does pass through a filter, is what we are told. A return air vent that pulls air which will be blown into the second floor rooms of the home. 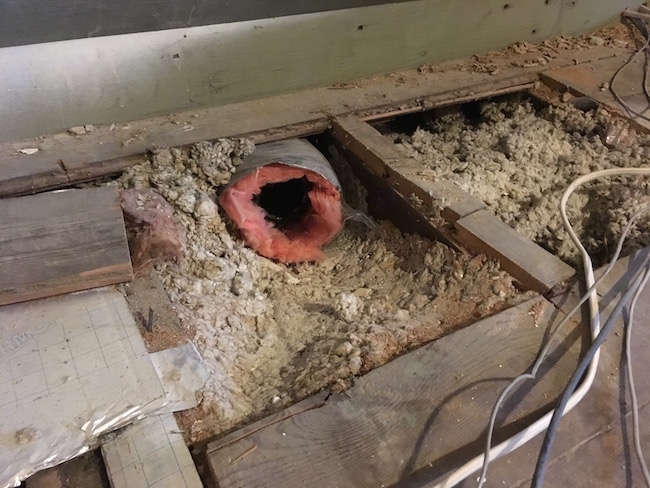 Fiberglass lined flex ducts that were connected to the HVAC system. 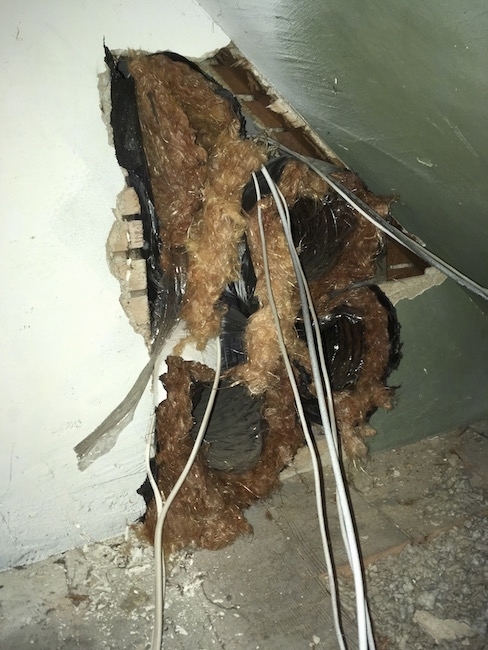 Wires running down into the floor, passing through the blown in spun glass to the lower levels of the home. 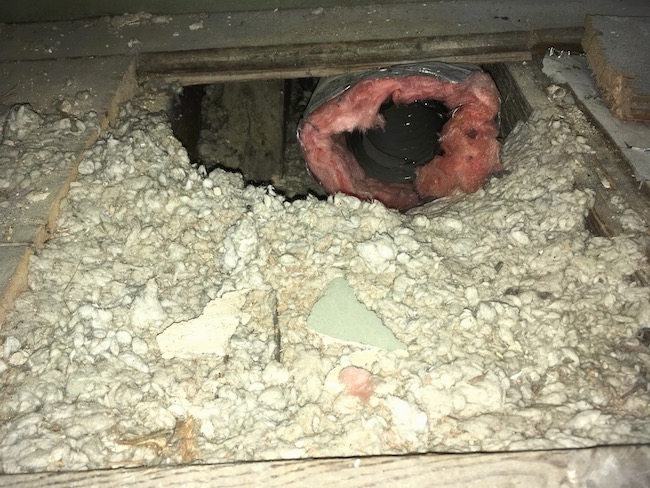 A flex duct wrapped in fiberglass running through loose spun glass along the floor cavity. 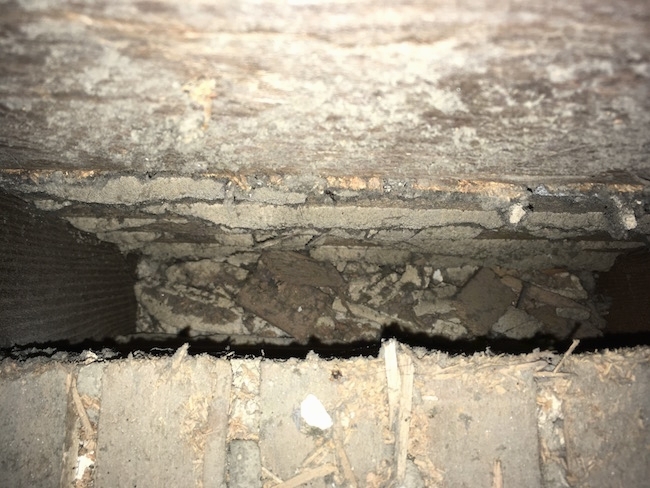 At some point this duct turns and runs down to the lower level of the home. 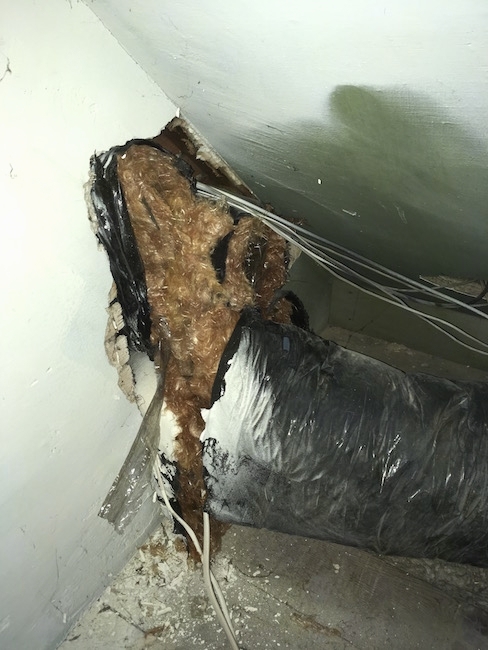 Flex ducts with fiberglass hanging out that were connected to the HVAC system running down the walls of the home. The house always had a small amount of glass floating around, but I did not notice until after we had the water leak on the third floor that got the loose, gray fiberglass wet. There are only so many toxins a body can handle at one time and when fiberglass gets wet it out gases and shatters at an accelerated rate. 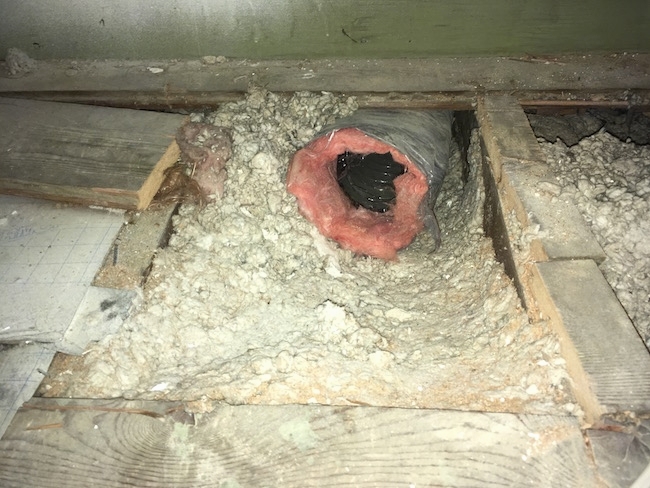 A flext duct poking out from the blown in loose fiberglass. When the job of removing the HVAC system was complete I noticed all of the workers standing around the outside of their truck coughing. All of them were hacking away and while they did wear gloves, none of them wore masks. 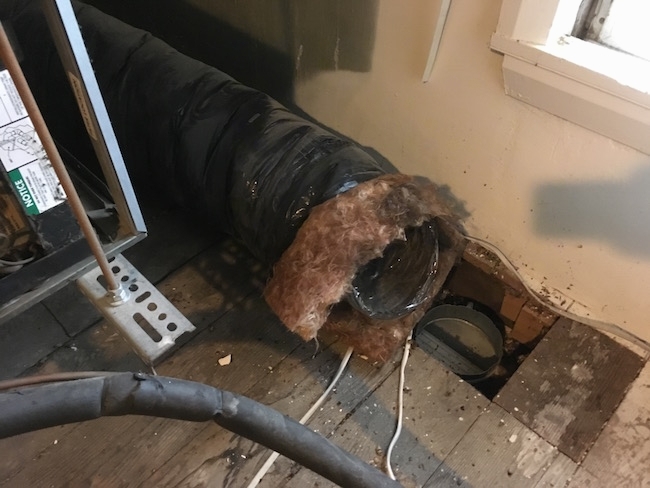 They all knew there was blown in insulation and insulation exposed around the flex ducts because it was visible. This is an example of a total lack of precaution due to the lack of warnings the manufactures put out. After all, how could airborne tiny glass particles be bad for a person's health?